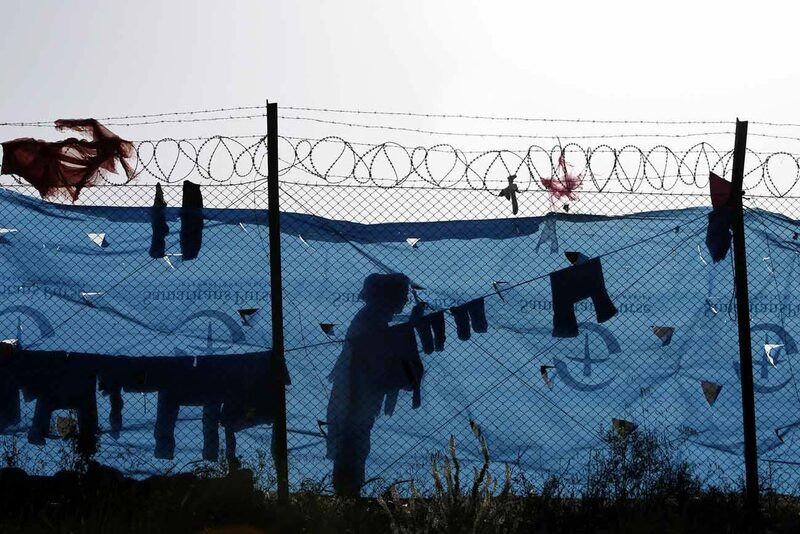 A refugee woman hangs her laundry behind a fence at a transit camp in Schisto, Greece, April 4. (CNS photo/Yannis Kolesidis, EPA). VATICAN CITY (CNS) — A papal think tank is convening a summit to tackle the threat to global stability posed by today’s refugee crisis. The Vatican summit will study ways to: end the war in Syria; establish humanitarian corridors worldwide, not just in Europe; not punish Great Britain for its disenchantment with current European Union mandates; help the “disaffected working class” through increased social spending; offer amnesty to victims of human trafficking; and foster development in low-income countries. “Walls and fences won’t stop millions of migrants fleeing violence, extreme poverty, hunger, disease, droughts, floods, and other ills. Only global cooperation toward social justice can do that,” the Pontifical Academy of Sciences said on its website. Titled “Europe: Refugees Are Our Brothers and Sisters,” the summit was scheduled for Dec. 9-10. A list of participants was not yet available as invitations were still being sent out, a source told Catholic News Service July 28. The academy placed special emphasis on the importance of the world’s mayors, saying on its website, “they must be provided with the ability to meet the needs, accommodate and regularize all types of migrants or refugees” as well as promote cooperation and sustainable development, justice and peace. The summit was called “to bring immediate attention to the threat posed to global stability by the growing presence on our planet of over 125 million refugees,” who are in need of immediate attention, the academy said. It said it was responding to Pope Francis’ ongoing call to do more to prevent humanitarian crises and deliver concrete, adequate and timely responses to those most in need. “Supplying tents and drinking water that arrive after everyone is dead of cold and dehydration is totally unacceptable,” it said. The remaining quarter of humanitarian crises are linked to natural disasters, of which many, in turn, are linked to human-related activities, it said. “This summit will seek new ways to make peace, ways appropriate to our own times with all the opportunities that are available to us to bring people together, ways that underline the human dignity of all refugees,” it said. Humanity has a moral duty to use the immense wealth at its disposal to stop war and its consequences, the academy said. Of the concrete proposals that will be looked at, one called for recognizing the underlying discontent over the “unmanageable influxes of refugees and joblessness” behind the vote motivating Britain to leave the European Union. The Pontifical Academy of Sciences website also released details of an upcoming plenary session in November that will look at the impact science and technology have had on humanity and the environment. It will end with a “special session” dedicated to the reported benefits of genetically modified crops and foodstuffs. British biochemist and Nobel laureate Richard J. Roberts will present a talk on the “devastating effect of regulation” and a Nobel laureate campaign in favor of GMOs.